Almighty ever-living God, we humbly implore your majesty that, just as your Only Begotten Son was presented on this day in the Temple in the substance of our flesh, so, by your grace, we may be presented to you with minds made pure. Through our Lord Jesus Christ, your Son, who lives and reigns with you in the unity of the Holy Spirit, one God, for ever and ever. Today the Church celebrates the feast of the Presentation of the Lord which occurs forty days after the birth of Jesus and is also known as Candlemas day, since the blessing and procession of candles is included in today's liturgy. Today's first reading gives us an important insight to understand profoundly the mystery of the Lord’s Presentation in the Temple by Mary and Joseph, in accordance with the canons of Mosaic Law. The text, taken from the Prophet Malachi says, ‘I am sending my messenger to prepare the way before me; and suddenly there will come to the temple the Lord who you seek’ (Mal 3:1). From all the Gospels, we know that it is the Precursor, St John the Baptist who was born 6 months before Jesus, that God sent to prepare His way. Putting these evangelical facts together, we can comprehend the words of the Prophet Malachi. The Lord God promised that He would send a Precursor to prepare His way. Since there is only 6 months between the birth of St John the Baptist and Jesus it is clear that the prophecy meant that suddenly after the Precursor, the Lord Himself will come. So, soon after the Baptist’s birth, God entered His temple. Jesus’ presentation signifies God’s entrance to His temple. God made man entered His temple, presenting Himself to those who were really searching for Him. Today’s Gospel introduces us to different people and events that in themselves provide numerous lessons and themes for further reflection. First of all, Mary and Joseph respect the Mosaic Law by offering the sacrifice prescribed for the poor: a pair of turtledoves or two young pigeons. 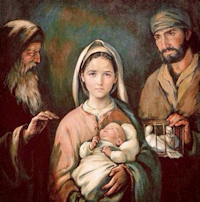 Simeon and Anna were two venerable elderly people dedicated to prayer and fasting and so their strong religious spirit rendered them able to recognize the Messiah. In this sense we can see in the Presentation of Jesus in the Temple an extension of the ‘Pro Orantibus Day’ (For those who pray) that is celebrated on the feast of the Presentation of Mary (21 November). On this day, the Church demonstrates its gratitude to all those in the community that dedicate themselves in a privileged way to prayer, to those who have a particular religious vocation to the contemplative life. In the figure of the venerable Simeon, Jesus’ presentation in the temple, also reminds us that prayer and contemplation are not just a waste of time or an obstacle to charity. On the contrary, time could not be better spent than in prayer as true Christian charity is a consequence of a solid interior life. Only those who pray and offer penance, like Simeon and Anna, are open to the breath of the Spirit. They know how to recognize the Lord in the circumstances in which He manifests Himself because they possess an ample interior vision, and they have learned how to love with the heart of the One whose very name is Charity. At the end of the Gospel Simeon’s prophecy of Mary’s sufferings is emphasized. Pope John Paul II taught that, ‘Simeon's words seem like a second Annunciation to Mary, for they tell her of the actual historical situation in which the Son is to accomplish his mission, namely, in misunderstanding and sorrow.’ (Redemptoris Mater, n16) The archangel’s announcement was a fount of incredible joy because it pertained to Jesus’ messianic royalty and the supernatural character of His virginal conception. The announcement of the elderly in the temple instead spoke of the Lord’s work of redemption that He would complete associating Himself through suffering to His Mother. Therefore, there is a strong Marian dimension to this feast and so in the Liturgical Calendar of the Extraordinary Form it is called the Purification of the Blessed Virgin Mary. This refers to the other aspect of the presentation that consists of the ritual purification of Jewish women after they had given birth. In Mary’s case this purification was not necessary, but it indicates the renewal of her total offering of herself to God for the accomplishment of His Divine Plan. 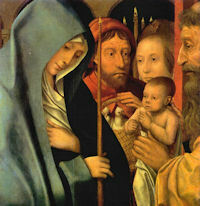 Simeon’s prophecy also announces that Christ will be ‘a sign of contradiction’. St Cyril of Alexandria, in one of his homilies, interpreted the words ‘sign of contradiction’ like a noble cross, as St Paul wrote to the Corinthians ‘a stumbling block to Jews and foolishness to Gentiles’ (1 Cor 1:23) […] It is a sign of contradiction in the sense that those who loose appear as foolish while in those who recognize its power [the cross] reveals salvation and life’ (c.f PG 77, 1044-1049). These too are mothers in God's plan and are about to give birth to future members of the Church. From this intuition and a certain mimesis of the purification of Our Lady, the rite of purification after birth was developed, some of whose elements reflect negatively on birth. Read this article to see what the connection between Candlemas and Groundhog Day.